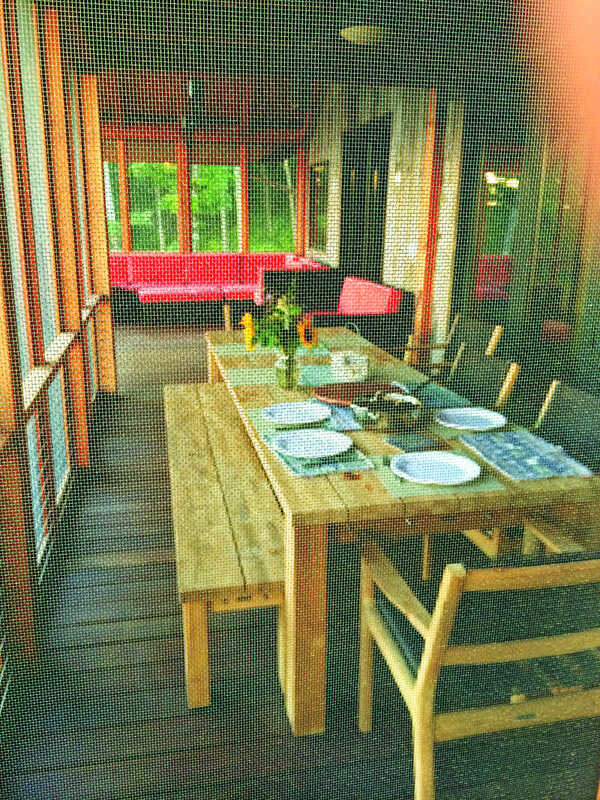 Recently we did a project with Black Oak Builders and Barry Price Architecture in Saugerties, NY. Interestingly for us, the majority of the project was not timber frame (though they do have a sweet little timber piece off the side of the garage that may someday house a small maple sugaring operation). No, in this case Black Oak Builders reached out to us to partner on the enclosure system for three additions to this 1800’s home; a master bedroom suite, an office/bedroom wing, and a two-story garage. Our goal with High Performance Enclosures (HPE) is simple—to help builders achieve better building performance for their clients and to make the projects go as smoothly as possible. 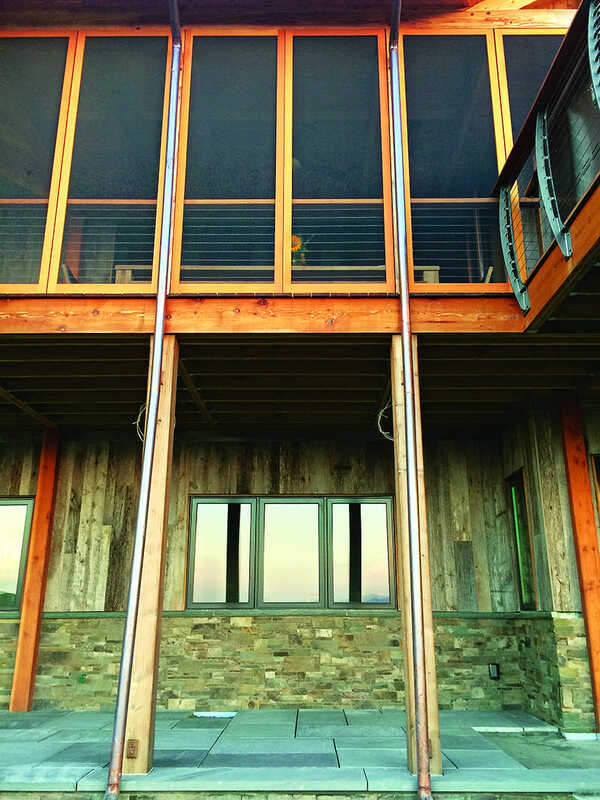 With our knowledge in systems building (from years in timber framing, as well as construction experience in our Finger Lakes backyard) we can bring the nuances of off-site construction to enclosure building and pre-panelization to those looking for custom solutions. Our construction team built 66 panels in about 2 weeks and headed out in a snowstorm to install the them in January. This off-site minimizes the time needed on-site, saving projects weeks and speeding up the deliverable of a finished space to a client. The enclosure was our MartixS wall system. Built of 2×6 framing, ½ OSB, 60mm wood-fiber insulation (Steico in this case), house wrap, and vertical strapping for attachment of the siding. All designed to fit within the 8’6” shipping constraints. The Steico wood fiber insulation allows one less petroleum-based element in the system and an opportunity for carbon sequestration—both pieces that help our buildings carry a load in slowing climate change. Used with the Mento Plus house wrap (a weather resistant barrier that is extremely waterproof and air tight while allowing the wall to dry to the exterior) and the tightness of the panels themselves, the performance of these new spaces should make a sizable impact to the client’s comfort, HVAC costs, and do a favor for our planet. From a timeline standpoint there are advantages for off-site enclosure construction as well. “Framing of all three structures was achieved in six days. This significantly reduced the schedule timeline, as well as the inconvenience to the owners living on the site. These are not small considerations from an owner’s standpoint,” says Barry Price. As with all of our projects, there had to be a twist. Because of the tight site, the panels were delivered to a parking lot up at the main road and shuttled to the site on smaller trailer. We then strategically began installation of the master bedroom before raising the garage walls which restricted access to the back of the site with equipment. 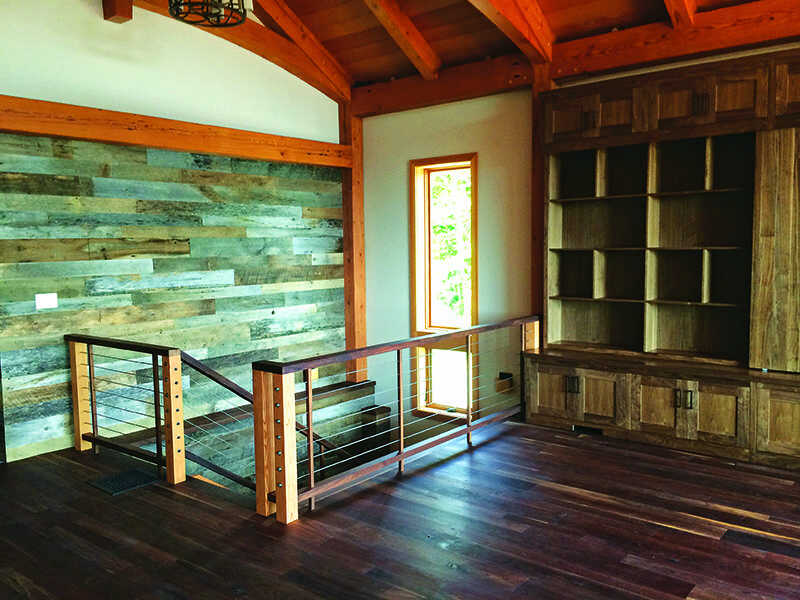 Then, in order to allow Black Oak Builders to delay demolition of the existing stacked stone walls until they were closer to having the new additions dried in, we left off on installing the tie-in walls for when construction was a little further along. To us, it’s just another day and the challenges are what keep projects interesting. If you have a custom project you’re looking and you’re looking for an enclosure partner, be sure to give us a call or email and let’s chat about what’s possible. This tree had a purpose, a destiny even. The 60-year-old Acer Macrophyllum Big Leaf Maple was selected by my co-workers Randy and Noah (from Randy’s land) for its particular size, shape, and branch structure. It would become a load-bearing post and not just any post – it will support a 30,000 lb gravity load and an 84 foot glulam beam line in our new Cross Laminated Timber (CLT) building in Farmington, NY (the first complete CLT building in New York State!). Using some experience from previous projects, the support of my colleagues, and a little book knowledge I picked up at the Timber Framers Guild conference, I got started. First, I snapped out the reference lines – this would orientate the precise position of the beam pocket and base cut (where all the pressure is). Second, I set the tree onto sawhorses and played with the overall shape. This was my favorite part because it is all about balance and feel. This was where I got to imagine how the piece I was working was going to orientate when it was done. I had to get high over the tree and observe its relationship with the lines I snapped. I even laid down and looked at it from the side, imagining how it will look as the post I wanted it to be. Once I was set on the position of the tree in relation to the joinery I began to mark my datum lines and started layout of the beam pocket. One thing to mention is that plans were for the beam pocket to be made up of two upright co-dominates. (Co-dominate, in this case, refers to how the main trunk splits and becomes two. This is a fun thing I learned from our newest addition in the timber frame shop, Noah Mize. He comes from an arborist background and is very knowledgeable.) I got out the laser to guide my cuts, after all it is the 21st century. The chisel work was a true joy. The chisel seemed to glide effortlessly allowing me to really push for precision, without losing sight of efficiency. That was the first upright. The second proved to be much more difficult. Long story short I had to tap out the lap joint all upside down and overhead. I had to squat on a block of wood 7″ off the ground while operating my chisel at shoulder height to make a flat which was facing the ground. Awkward, to say the least. To add to the difficulty the location of the work was right near the union, or point where the trunk splits into two. Needless to say the grain got harder and ran in all directions at once, or so it seemed. The time for the post bottom cut was upon us. Randy brought in his O44 chainsaw with a 42″ bar to preform this work. We made a couple test cuts and away we went. The final cut was cleaned up with a 12″ planner to flat with the layout marks re-written on the fresh surface. Our McMinnville and Portland OR teams, as well as our Farmington NY teams, signed the base of Atlas prior to raising. With the base cut done this was no longer a tree; it was a post. I could imagine myself as this post, holding my arms out wide supporting the timber [much like Atlas]. I can truly say it was my honor to pour my love and energy into tree. It was my privilege to be part of giving this tree to its new life, a post at the heart of our new fine woodworking shop. Atlas arrived to Farmington, NY on a typically snowy January day. Mike readies Atlas for raising. Mike applied leverage and muscle to turn Atlas into the precise orientation for the frame. 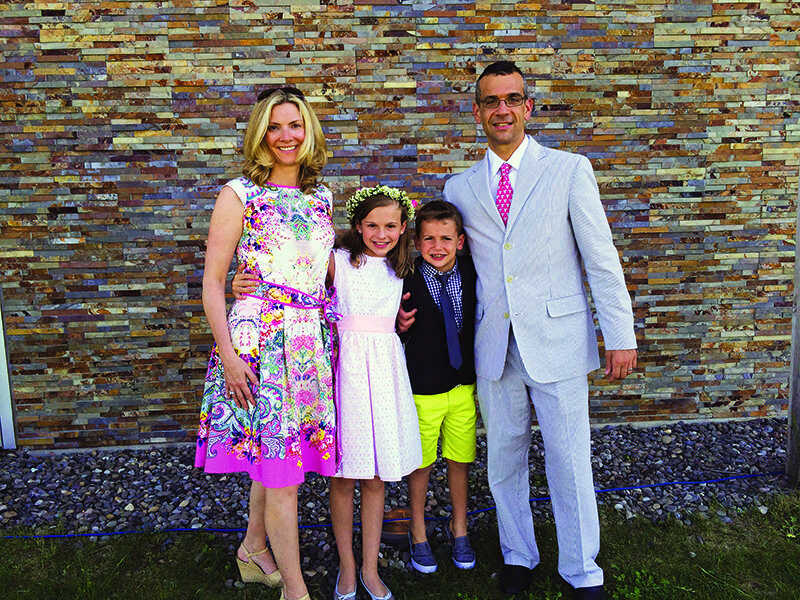 Element of Surprise is the seventh installment in Timber Home Living‘s Welcome Home Series, following the Olsens’ home project. The home is nearly complete thanks to creativity, collaboration and — of course — a few last-minute design decisions. Everyone loves a good sports analogy, and Greg Olsen is no exception. In a word, Greg encourages other folks in his same position to be flexible, fluid — open to new ideas. One surprising detail that the Olsens changed as the house was being built was the walkout bluestone patio that now runs the entire length of the home instead of the simple concrete slab that was originally part of the plan. 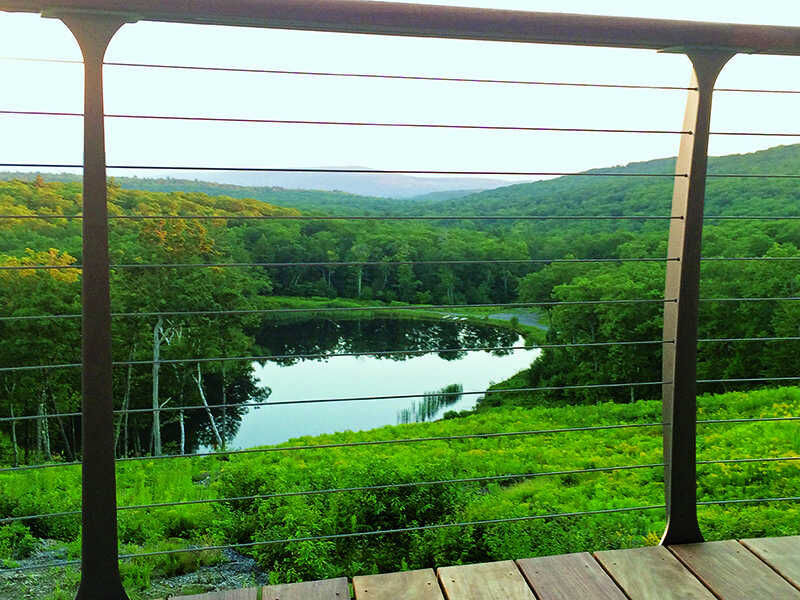 Katie Levin, interior designer at New Energy Works Timberframers, takes this idea a step further, emphasizing that you really can’t make design decisions independent of one another — it has to be an organic process. “One decision really leads to another when it comes to interior design. And, if you’re working with a reputable company, the design team should help steer you toward these decisions, asking you questions along the way to make sure every detail is exactly what you pictured. Of course, the more interior design decisions you can make ahead of time, the better. And with the end in sight, the results couldn’t be much better, says Greg. 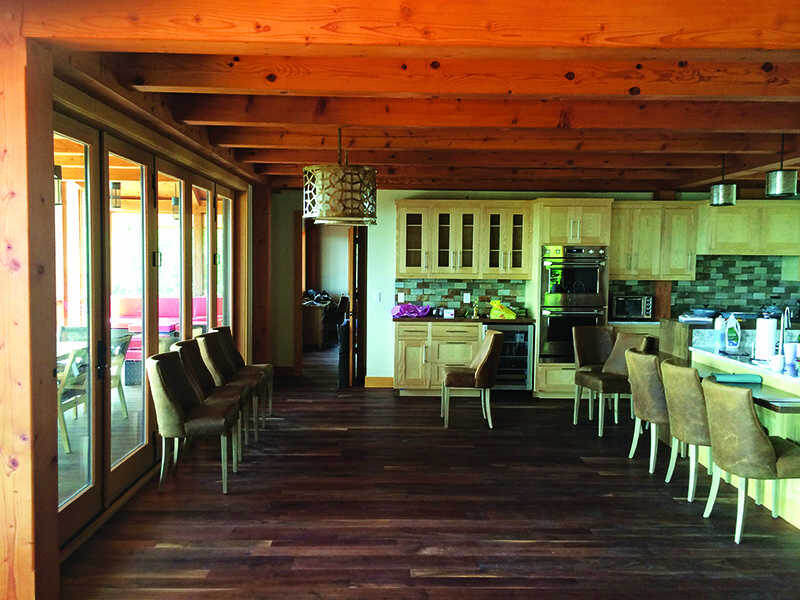 “Interior design is a lot different than interior decorating; it’s much more technical,” explains Katie Levin, interior designer with New Energy Works Timberframers. When designing your plan and choosing your finishing options, remember to think about items like fixtures and appliances well before construction begins. The unique combination of finishes is apparent in the great room. Dark walnut floors paired with the rich Douglas fir frame create the perfect contrast against the light cabinets and reclaimed walls. The NEWwoodworks team (a division of New Energy Works Timberframers) created floor-to-ceiling built-ins and an entertainment center to perfectly suit the space. Fifteen volunteers from the Bridges to Community group along with Nicaraguan families gather in front of one of the new homes in El Mojon. Nearly 4,000 feet above sea level, rainy season was in full swing in El Mojon, NI. The trip was organized by Bridges to Community, a NY-based secular NGO (Non-Governmental Organization) that focuses on housing and sanitation in Nicaragua and the Dominican Republic. Jonathan and Jake joined the mud-boot trend while laying up walls for two homes. We went with 15 other volunteers, totaling 8 teens and 9 adults, to a tiny village called El Mojon, in the mountains above Jinotega, NI. Elevation was about 1,200 meters (almost 4,000 feet) and it’s the rainy season in Nicaragua so rubber boots are all the rage. There are no paved roads where we were. We stayed at a small farm (or finca) that has accommodations for groups. One of their crops is coffee, and at harvest time numerous hands are needed to pick the ripe berries. An average adult can pick about 80 liters of berries a day, for which he or she can earn $4.20 USD, plus some square meals and a place to sleep. During the off-season, general farm labor and crop maintenance pays $3/day. The farm we stayed at was third generation, but only about 50 years old. It’s almost non-existent carbon footprint is fascinating. Electricity came from a water wheel fed by rain-collection pools higher on the mountain. The generator could produce either 220 or 110 volts, and was shut off, with the water re-directed, for much of each day. Most all the food (except rice) was made on site. Crops of lettuce, cabbage, potatoes, beans, corn, and tomatoes are grown. Cows are raised for milk and beef, pigs and pelliwags (a cross between goat and sheep), are grown for meat. Milk is made into cheese and any food left over is sold at the market in Jinotega. The 9 men slept in bunk beds with 2” mattresses in an 11×14 room. Each day, we were all ferried 30 minutes to the job in the back of 2 pickup trucks. Meals were served at the finca, rice and beans (of course), fresh salad (typically a no-no in the third world), flautas and tortillas, farm cheese, fresh chicken sometimes, and even American-style pancakes on the last day. Each morning I would wake to a rhythmic tha-thump, tha-thump, tha-thump, thut, thut, thut and repeat, beginning around 5 and going on until after we would leave. I walked into the kitchen to see what it was, finding one of the women hand-making tortillas, as she likely had been for the previous thirty years. Her rhythm was so perfect, one of the guys was convinced it was the water pump. Buckets of concrete were hand carried up the hill to the build sites. Our job was to lay up the walls of two new homes for two families. Both foundations had been set already. The house Jake and I worked on was above the road a bit, perhaps 50 meters up a path. We needed to move block to the site, sift the sand to eliminate stones, mix concrete and water, fill buckets, then carry it up the hill to the house. Three skilled masons laid block, set re-bar into the walls (Nicaragua is extraordinarily prone to earthquakes) and applied parging. The water well was 80-meters one way, although the sand pile was a bit down the road, while the 46kg (101lb) bags of concrete were up another rise in the grandmother’s wood hut (in the room where she slept, because it was the only room around that seemed dry enough to store them). The masons were amazing guys who cared for their work, their jobs, and for us, knowing that conditions were neither ideal nor efficient, they were just conditions. In three days the walls were up on both homes (6-meter x 5-meter floor space). The 300 sf new home will be divided into 4 rooms: a kids’ bedroom, a parent bedroom, a sitting area, and the kitchen. There are 2 doors and 2 windows in each house. The “Tiny House” movement here in the states has precedent, for sure. We then took a break while the masons welded a steel frame and panel onto the top of the walls (for the low slung gable roof), and dry-laid the tile onto the dirt-and rubble floor we had prepared. The final day on site included the presentation ceremony from us to the recipients. Our work there had saved construction time roughly 20 days, but more importantly, the group raised the money to pay for the masons and materials. Of the many things said, the mother’s words hit hardest: “I can now raise my family off of the wet dirt, and lock my doors when we leave”. Our group ranged from the most conservative Texan to the most liberal Oregonian (guess), and we can all bring our opinions and knowledge to the reasons why these families needed our help, but none of us questioned the value of being there that moment, that day. As always, friendships were born, and yup, that redneck Texan is sure-‘nuff heading to Portland for a good visit and wine tour. Thanks a million to my co-workers, who as always, totally had my back while gone. And to Maxine, who, as always, remains my home beacon of warmth and sanity. This fall, our friends at the Timber Framers Guild will raise the new Gateway Community Visitor’s Center in Schuylerville, NY. The new timber frame building will be constructed at the site of General Burgoyne’s surrender in the Revolutionary War and will serve as the starting point for tourism of historic sites in the upper Hudson Valley. From September 5th through the 15th, instructors will work with more than fifty students and volunteers to process approximately 24,000 board feet of locally sourced white pine and red oak timbers to form the community center. Mike Beganyi, our New England representative and timber frame designer for the Schuylerville Community Building Project, and Timber Framers Guild Project Manager Neil Godden have incorporated characteristics of the Dutch barn frames native to the area into the Gateway Community Visitor’s Center plans. 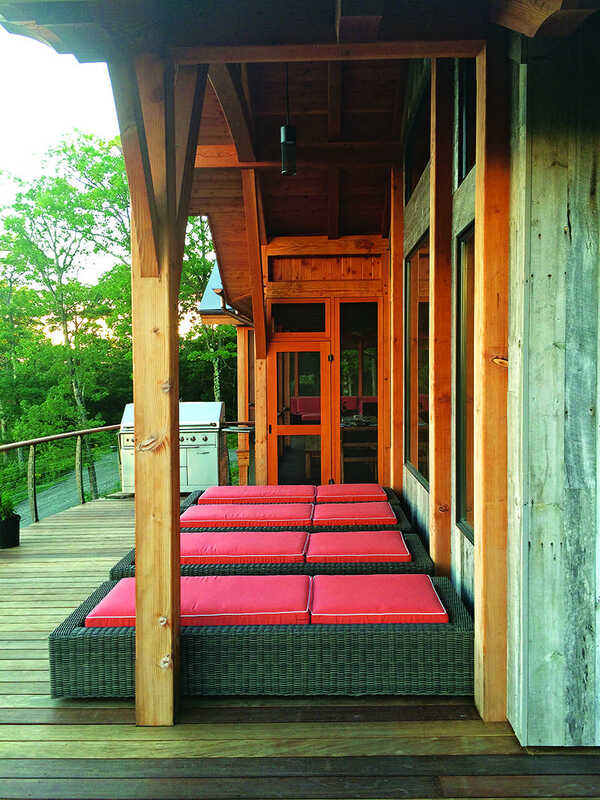 “The timber frame is a modern take on a traditional Dutch style barn that was common in the Hudson Valley”, states Beganyi. “The traditional design has been adapted to meet program requirements for a visitor center which will house interpretive displays rotating exhibits, and host community events.” Large anchor beams with thru tenons and celebrated joinery will tie the frame of locally harvested pine and hardwoods together. A community hand raising of the Gateway Community Visitor’s Center frame will take place on September 14th and 15th. 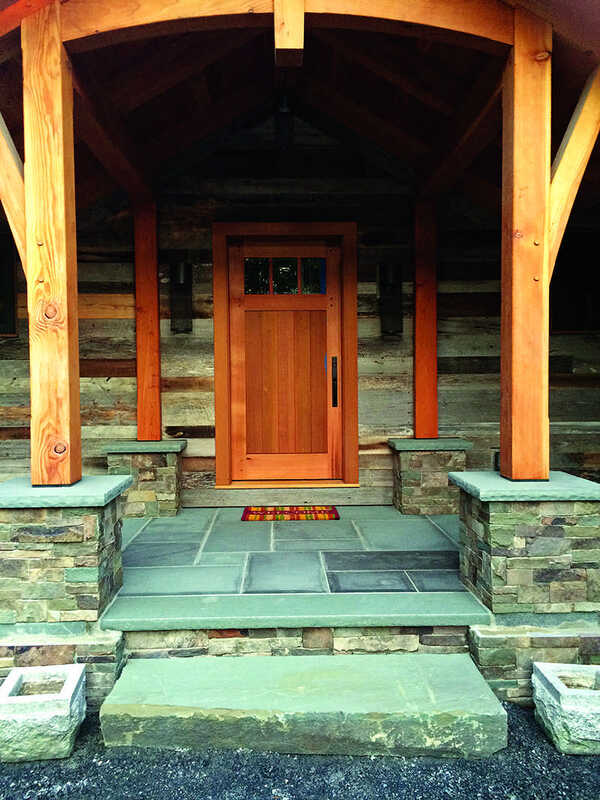 Since 1988, the Timber Framers Guild has collaborated with communities to create over seventy-five timber frame structures. Throughout their time, they’ve worked in the US, Canada, Suriname and Poland and have built timber frames for bridges, market pavilions, picnic shelters, park structures and house frames for a Habitat for Humanity affiliate.